You are here: Home / What is American Board of Optometry Board Certification? / How do I earn Board Certification? How do I earn Board Certification? Demonstrate your competence and commitment to lifelong learning through the American Board of Optometry’s Board Certification and Maintenance of Certification. Our process is rigorous but rewarding. To download a printable handout on becoming a Diplomate, click here. Submit nonrefundable application fee of $300.00. State adherence to principles of the Optometric Oath. 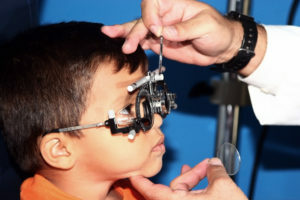 Acknowledge that American Board of Optometry Board Certification must be kept current through enrollment in the 10-year Maintenance of Certification process. Affirm that all supplied information is true and correct. Grant permission to the American Board of Optometry to verify all credentials. Authorize search of National Practitioner Data Bank (NPDB). Our verification process is thorough and efficient. You will be designated as COMPLETE on your Learning Builder page once your credentials have been confirmed. Please do not contact the American Board of Optometry, your school or state board during the process. If for some unusual reason verification is not completed within 30 days of your date of application, please contact us. Contacting any other school or agency will only serve to delay the process. Upon confirmation of all Qualifying Requirements, you will be granted ACTIVE CANDIDATE status by the American Board of Optometry for a period of one year. You may renew your Active Candidate status for up to three years total by entering proof of completion of 50 points toward the Post-Graduate Requirements for each year of eligibility. Active Candidate status does not imply Board Certification, but may be used in certain credentialing processes. To be eligible to take the examination, Active Candidates must attain 150 points in accordance with the ABO's "residency or equivalent" process. If points are not attained by completion of an ACOE accredited residency, the Candidate must show evidence of three years of active licensure and clinical practice. Click here for a downloadable overview of exam qualification requirements. Residency (ACOE Accredited) - 150 points if completed less than 3 years ago; 100 points if completed 3-10 years ago; and 50 points if completed more than 10 years ago. Fellowship in the AAO, COVD, NORA, CLSA, SLS - 50 points if completed within the previous 10 years*. Diplomate of a section of the American Academy of Optometry* - 50 points if completed within the previous 10 years. *Note: Fellowship and Diplomate status must be active and current as defined by the organizations. Education - Up to 150 points. Active Clinical Practice - Five points for each year of practice in the previous 10 years (up to 50 points). Note: Education expires three years from date of completion. However, once education has been submitted for verification, it is locked in through the next testing period. Live, in-person, continuing education lectures and workshops, live webinars and distance learning courses with examinations approved by a state optometry board, COPE or an ACOE accredited member of ASCO. Must receive a passing grade as determined by the course provider. A maximum of 50% of education points can be from Category 2. Other educational activities not listed may be submitted for consideration by the American Board of Optometry. Activities cannot earn duplicate credit; for example, if you are claiming points for Fellowship in the American Academy of Optometry, a case report used in the FAAO process cannot be claimed toward Category 2E credit. Presentation of educational activities at schools and colleges of optometry accredited by the Accreditation Council on Optometric Education (ACOE), or medical schools approved by the Liaison Committee on Medical Education (LCME). Educational or scientific activity portions of hospital meetings; national, regional, state or local optometric or medical meetings; or grand rounds not approved by COPE or a state board. ABO-authorized Performance in Practice activities. Programs by a university or college that are designed to enhance a participant’s instructional, research, administrative, or clinical knowledge and skills Note: Category 2E programs are worth 50 points if completed within 10 years. Teaching health-care students or health-care professionals. Review/editing of manuscripts for publication in a peer-reviewed optometry, medical or scientific journal. Publication of a clinical, review or research article in a peer reviewed optometry, medical or scientific journal. Presentation at scientific portions of meetings to include, but not limited to, those of the American Academy of Optometry, SECO, Association for Research in Vision and Ophthalmology, or AOA Optometry’s Meeting®. Submit 150 points of Post-Graduate Requirements. Your record must show three years of active licensure and clinical practice, OR completion of an ACOE-accredited residency. The verification process can take up to 30 days. Once verified, you can register for the exam by paying the examination fee of $950. For recent graduates and residents, there is a reduced exam fee. Please call our office to determine your eligibility. Then, schedule your exam at a Prometric Test Center. The Board Certification examination is a computer-based patient assessment and management examination that emphasizes clinical knowledge and skills, not didactic details. In the years after graduation from optometry school, you acquire valuable clinical experience. Reassessing your practical knowledge and skills every 10 years is a means of demonstrating that you are maintaining the appropriate knowledge, skills and experience needed to deliver quality eye care. Standardized assessment is crucial to ensuring credibility of any board certification process. Examinations are held twice annually at Prometric Test Centers worldwide. Active Candidates should pass the examination within 12 months of submitting exam registration. An optometrist who does not pass within 12 months can re-apply for the examination, but is subject to Post-Graduate Requirements. In addition, “Active Candidate” status applies for a maximum of four years. Active Candidates who pass the examination are Board Certified and are considered Diplomates of the American Board of Optometry. Successful candidates are notified by mail and via the Learning Builder portal. American Board of Optometry staff cannot give results over the phone or by e-mail. You will have an opportunity to specify how your name appears on your printed certificate. Diplomates can purchase additional certificates by contacting our office. Upon successful completion of the Board Certification Examination, the American Board of Optometry confers Board Certified status to the optometrist for a period of 10 years. Board Certification must be kept current through enrollment in the 10-year American Board of Optometry Maintenance of Certification process. For 2018, the annual maintenance fee is $225, which includes the annual Self-Assessment Module or Performance in Practice Module.